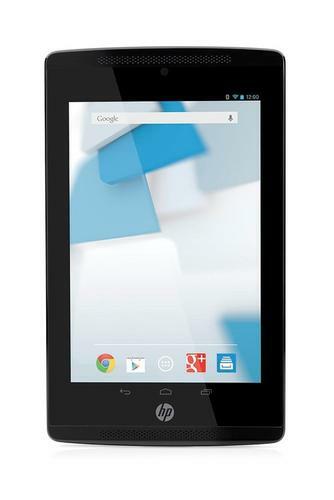 Hewlett-Packard's latest Android tablets with multiple screen sizes are available through the company's website. The tablets run Android 4.2, code-named Jellybean, and are listed at the company's tablet page. The list includes the US$199.99 Slate 7 Extreme with a 7-inch screen, the $329.99 Slate 8 Pro with an 8-inch screen, and the $299.99 Slate 10 HD with a 10.1-inch screen. The Slate 8 Pro offers 11.5 hours of battery and has the hardware to provide 4K video and gaming. The tablet has a quad-core Nvidia Tegra 4 processor, which has a graphics processor capable of handling 4K video. The screen can display images at a 1600 x 1200 pixel resolution. An HDMI port allows the tablet to be connected to TVs for 4K video. Other features include an 8-megapixel rear camera, a 720p front camera, 16GB of internal storage and a 1GB of RAM. The Slate 10 HD offers 10 hours of battery and is meant for Web surfing and basic multimedia use. The screen displays images at a resolution of 1280 x 800 pixels. It has a dual-core Marvell PXA986 ARM-based chip, 16GB of storage, a high-definition front camera and a five-megapixel back camera. Other specifications include 1GB of DRAM and a micro-SD slot. The Slate 7 Extreme is listed at the site, but is out of stock. The tablet offers 10.5 hours of battery life, and as the product name suggests, it is meant for entertainment and high-definition video. It has a Tegra 4 chip, making it capable of processing 4K video. Other features include a 1280 x 800-pixel screen, 16GB of storage, an HDMI slot, a five-megapixel rear camera and 0.3-megapixel front camera. The entry-level $149.99 Slate 7 Plus tablet, which is an upgrade from an earlier Slate 7 that was discontinued earlier this year, is also available. The Slate 7 Plus has 8GB of storage and an older Nvidia Tegra 3 processor. Other features include a 5-megapixel rear camera and a 0.3-megapixel front camera. The tablet offers six to seven hours of battery life. All of the tablets have Wi-Fi and micro SD slots.